Designed to convey wide variety of powdery, granular & lumpy bulk materials. Material is conveyed by single/ double strand forged / case-hardened chain links. 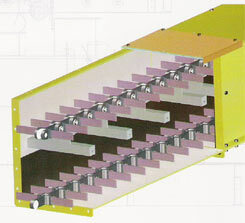 Wear resistant guide rails are provided in conveying and return path. Specially designed flight attachment are welded/bolted to the chain links. Supplied conveyors with Capacity range up to 325 m3/hr & Conveyor Length up to 60 m.
Offers flexibility in the plant layout viz. horizontal, Inclined & Horizontal + inclined profile, as required. 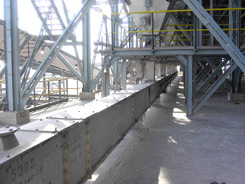 Multiple numbers of inlet and discharge openings can be provided at the required locations along the conveyor path.